The 10m band is a great band when it is open, offering the opportunity to work many countries that are often not heard on the other bands such as 20m. I came 1st in Australia, and 76th in the World in the Class B, Power B section, with a total of 46,096 points (268 QSOs and 86 multipliers). 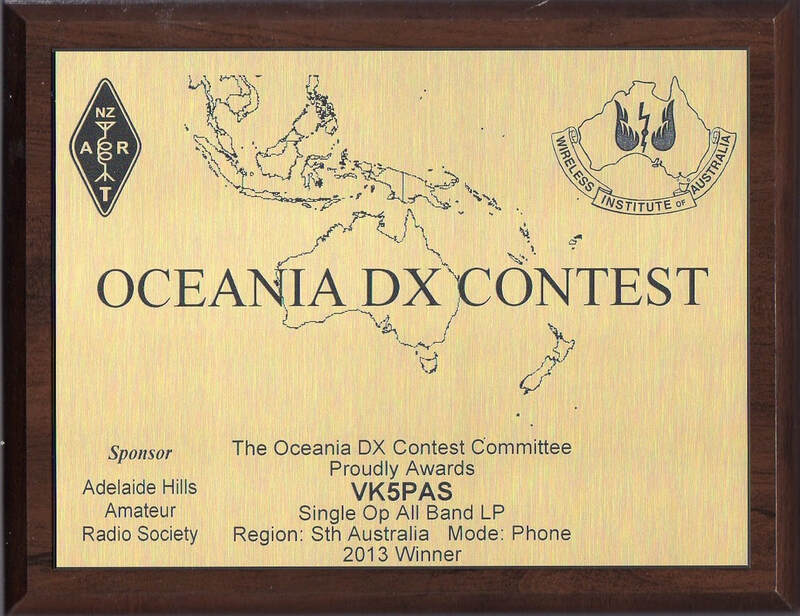 Unfortunately I had a busy weekend for the Oceania DX Contest 2013, and I could only dedicate a bit under 2 hours on the Sunday afternoon. But I was happy with my efforts. I ended up with 153 QSO's and a score of 19,803 points. Most of my contacts were on 20m, but I did sneak in a meagre 8 contacts on 15m into Japan, Australia, Indonesia, Malaysia, and Russia. 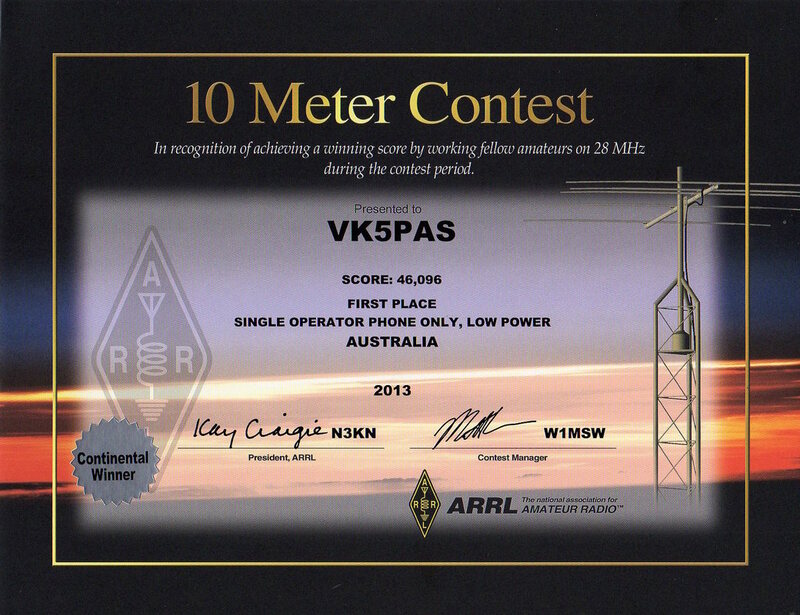 The Adelaide Hills Amateur Radio Society sponsored 2 plaques in 2013 for: VK5 Phone Single Op All band low power, and VK5 CW Single Op All band low power. I was fortunate to be awarded the Phone plaque. 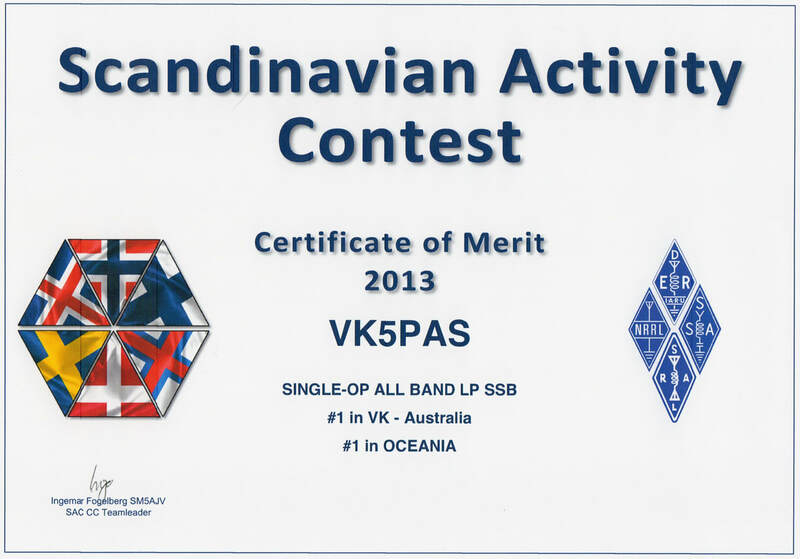 There were only 6 x VK5's last year that entered logs in this contest. Surely there are more VK5 contesters out there. Come on ! 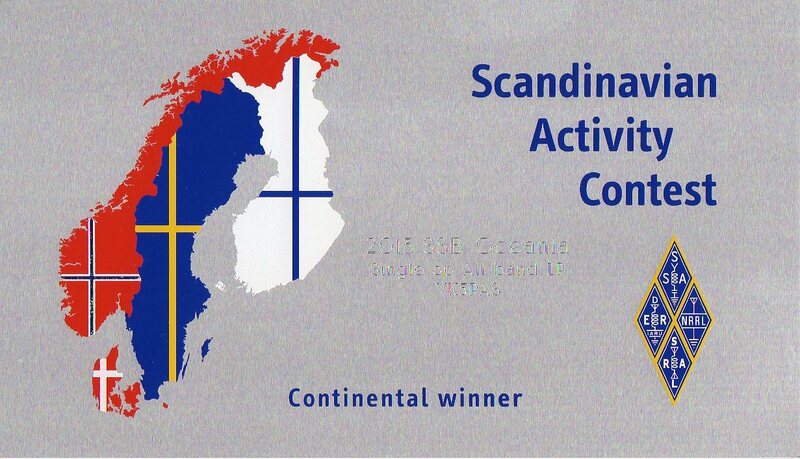 The aims of the SAC are to promote amateur radio activity within Scandanavia as well as to encourage amateur radio communications between Scandanavian and non-Scandanavian amateur radio stations. I entered the Scandanavian Activity Contest for a handful of hours this year. I ended up with 91 QSO's on 20, 15, & 10m with a total of 4,550 claimed points. 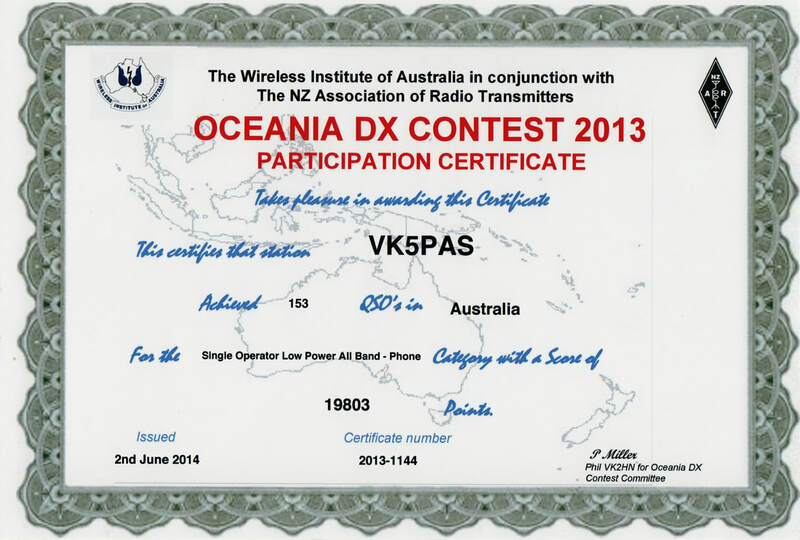 I came 1st in Australia and 1st in oceania in the 'Single Operator All Band Low Power' category. Another fun year. Unfortunately my contesting was broken up by a number of family & social commitments, and often when the band/s were open to JA. Both the 10m & 15m bands were open in the late afternoon/early evening, with good signals from Japan. Looking at the results on the JARL website, only 8 VK's submitted a log. This is surprising, because this is a really fun contest. The only frustrating thing is that the results are incredibly slow to be finalised. The PDF award certificates were not uploaded and released until 26th July 2016. Thats right...2016! Three years after the contest. I entered the 2013 CQ WPX Contest & obtained a score of 489,086 points in the Single Op Low Power non assisted Rookie category. I had a total of 495 QSOs and 338 different prefixes over a 22.4 hour period. I came 1st in Australia, 7th in the region (continent) and 5th in the world. 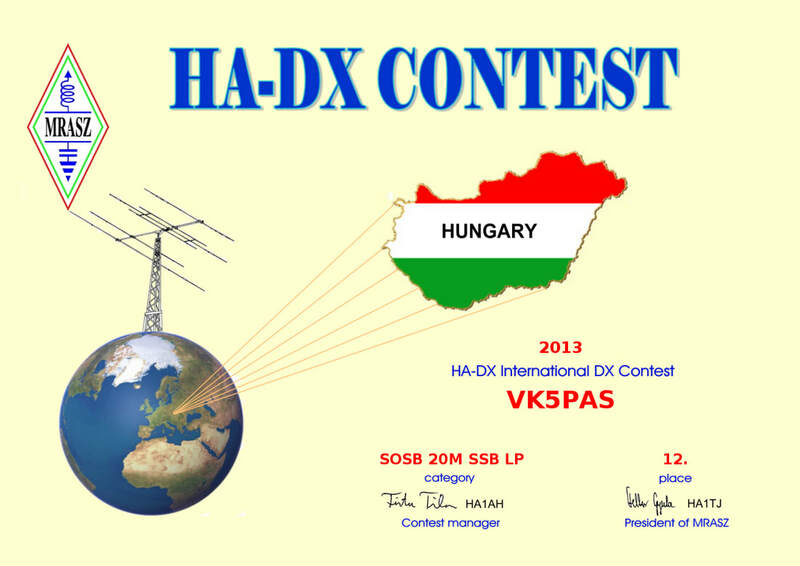 The Hungarian DX Contest (HA-DX Contest) was held on 19th & 20th January, 2013. This contest is organised by the Hungarian Radio Amateur Society. Its goals are 'to promote ther traditionally good friendship between the radio amateurs'. I entered in the Single op 20m low power category. I was 1 of only 6 Aussie amateurs who entered the contest. I put a hour or 2 in on the Saturday night and then Sunday afternoon. Conditions into Europe were very poor. I ended up with just 43 QSO's and a total score of 1008 points. The final results show I came 12th in the world and 1st in Australia in this Section. The 2013 Russian WW PSK Contest was held on 15th & 16th February, 2013. This was my first ever effort at a PSK Contest. I only worked a total of 17 stations, and ended up with a certificate. Goes to show that there are not many VK fellas using PSK31 or PSK63.